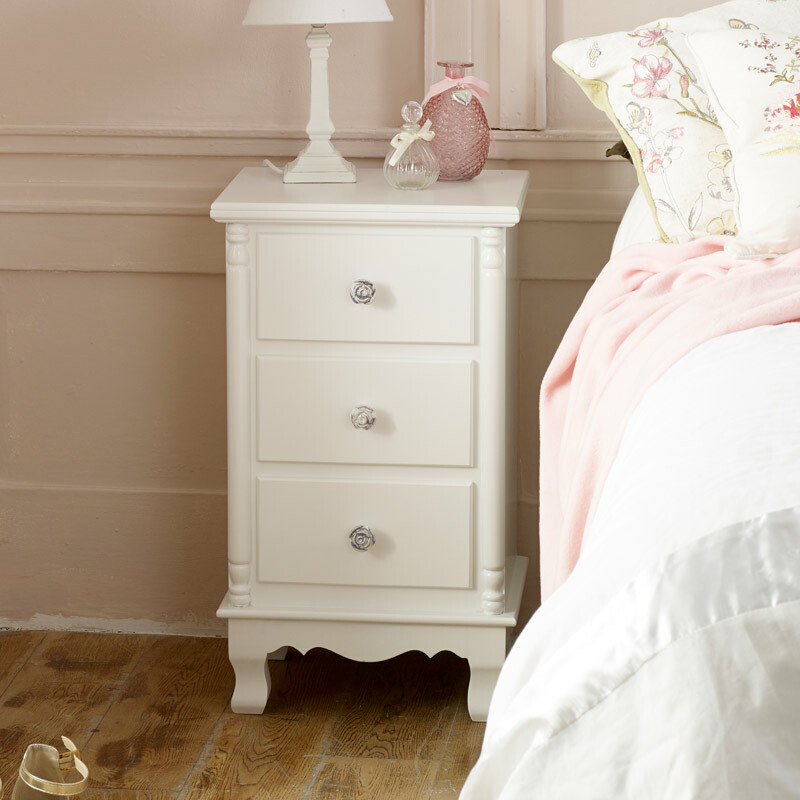 This pretty white French bedside table belongs to our shabby chic and vintage inspired Lila Range. With large sturdy drawers for storage, the natural wood is painted in a clean, crisp white colour that will compliment any home. This charming bedside chest is ideal for sitting at the side of the bedside giving you somewhere to put a bedside lamp whilst offering great storage with the 3 drawers. The chest features curved legs and pretty rose carved drawer knobs. With even more furniture available in the Lila Range, you can furnish your bedroom in stunning vintage French style. 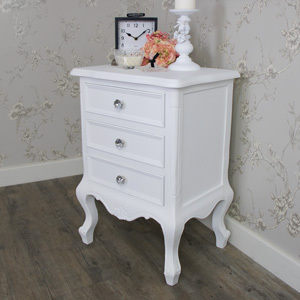 This pretty white French bedside table belongs to our shabby chic and vintage inspired Lila Range. With large sturdy drawers for storage, the natural wood is painted in a clean, crisp white colour that will compliment any home. 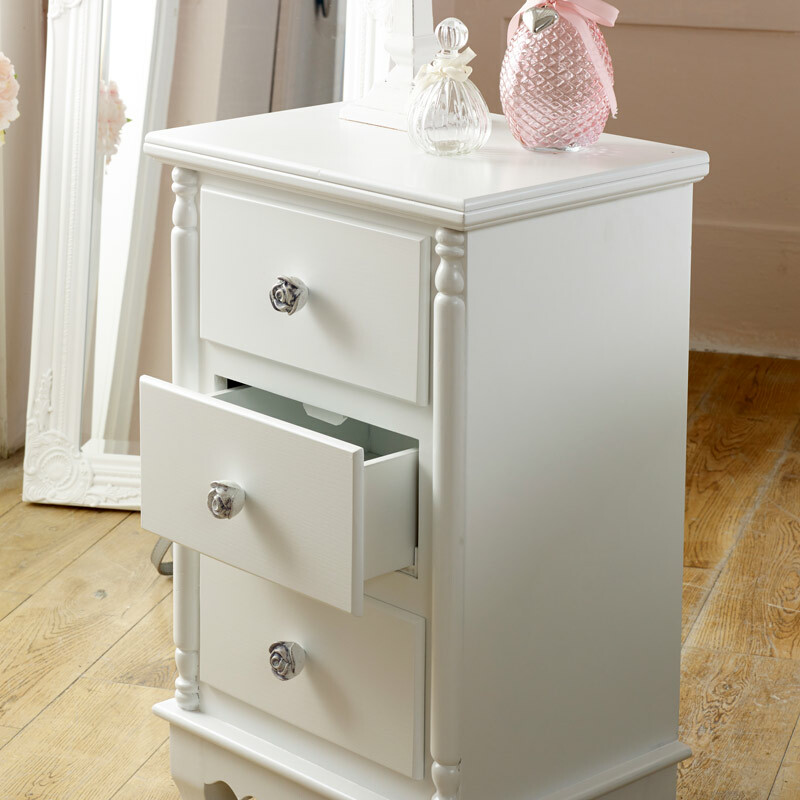 This charming bedside chest is ideal for sitting at the side of the bedside giving you somewhere to put a bedside lamp whilst offering great storage with the 3 drawers. 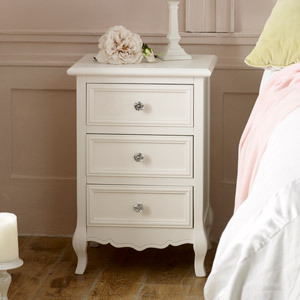 The chest features curved legs and pretty rose carved drawer knobs. With even more furniture available in the Lila Range, you can furnish your bedroom in stunning vintage French style. Made from wood and painted in white. The inside storage on the drawers each measure 22cm x 9.5cm x 23cm (width x height x depth).The bedside chest comes fully assembled.